Tamara Meneghini, associate professor of theatre at University of Colorado (left), plays Queen Elizabeth I, while her lady-in-waiting (Colorado student Bernadette Venters-Sefic), in a performance written by Nebraska historian Carole Levin. The play will be performed at the University of Nebraska–Lincoln Feb. 25 and 26. A little over a year ago, Carole Levin was often seated in her apartment, surrounded by her books. Normally taking shelf space in nearby bookcases, her collection on Queen Elizabeth I surrounded her. Levin, a professor of history at the University of Nebraska-Lincoln, was writing a play from the monarch’s own words, revisiting the political and personal events that shaped her reign and had arguably changed the course of British history. Levin, chair of Medieval and Renaissance Studies at Nebraska found the original sources -- letters, speeches and other writings -- to fill the play with the monarch's words. 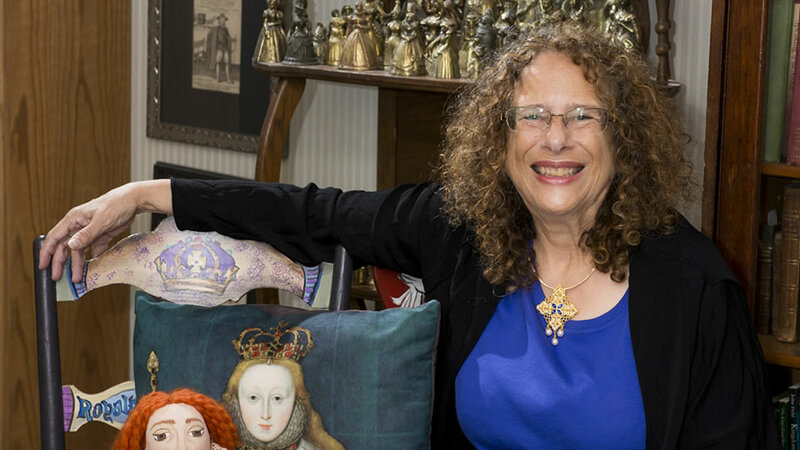 Levin, an Elizabethan expert, was commissioned by the University of Colorado, Boulder, in 2016 to write the play, with a performance to coincide with UC’s commemoration of the 400-year anniversary of William Shakespeare’s death. That play, “We Princes, I Tell You, are Set on Stages: Elizabeth I in Her Own Words,“ will have its Nebraska premiere 7:30 p.m. Feb. 25 in the Nebraska Union Auditorium. An encore performance will be 2 p.m. Feb. 26 at the Great Plains Art Center, 1155 Q St. That performance will be followed by a panel discussion with Levin, the actors and Ilona Bell, author of “Elizabeth I: The Voice of a Monarch.” The performances, co-sponsored by the Women's Center at Nebraska, are free and open to the public. Tamara Meneghini, associate professor of theater at Colorado and Bernadette Venters-Sefic, a student at Boulder, will reprise their roles as Elizabeth I and her lady-in-waiting, respectively. The play takes place near the end of Elizabeth’s life as she looks back on important events that took place. Her lady-in-waiting provides lines from Shakespeare’s works that reflect on Elizabeth’s musings and stories. While written in Elizabeth’s words and covering a broad range of historical topics, Levin said the play is accessible to general audiences.